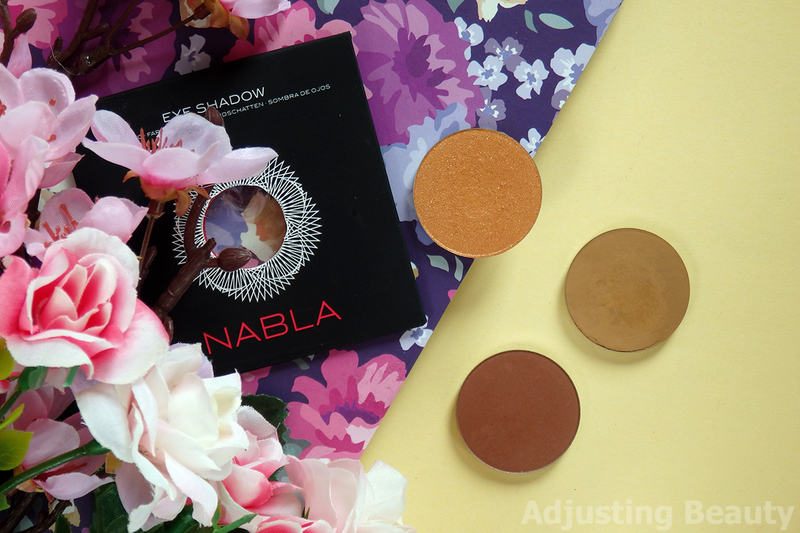 A while ago a new brand came to Slovenia and I was interested in trying it out, because Nabla offers individual shades that come as refills, so you can actually create your own color palette. I am always up for buying new interesting shades that I can complete my eyeshadow collection with. Apparently, Nabla is quite well known indie brand that was born in Italy. It's cruelty free and vegan. I bought three shades myself and I got one as a gift from a friend. Their refills come in a simple paper box. It almost looks like a tester. The pan is inside a cardboard square and there's a transparent foil protecting it, but making it visible through the packaging. 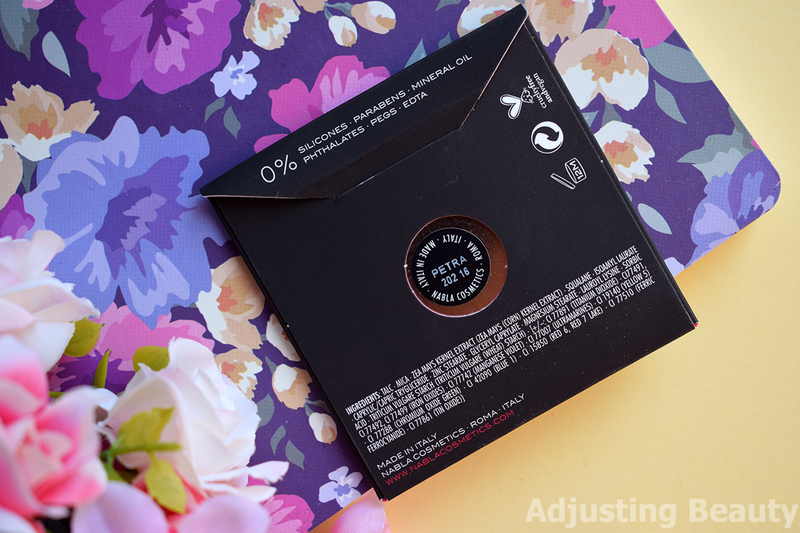 My complaint is that the eyeshadows can get easily squished while travelling, so a harder packaging would work better. In each refill is 2.5 grams of product and the price is 6.59€. I bought all of my shades on Ličila.si. The bottom of each refill is metal so you can put it in any magnetic palette. Size of these are for example bigger than Morphe Brushes single eyeshadows. They also have more product in them and are wider than eyeshadows in Zoeva palettes, theBalm and Too Faced. 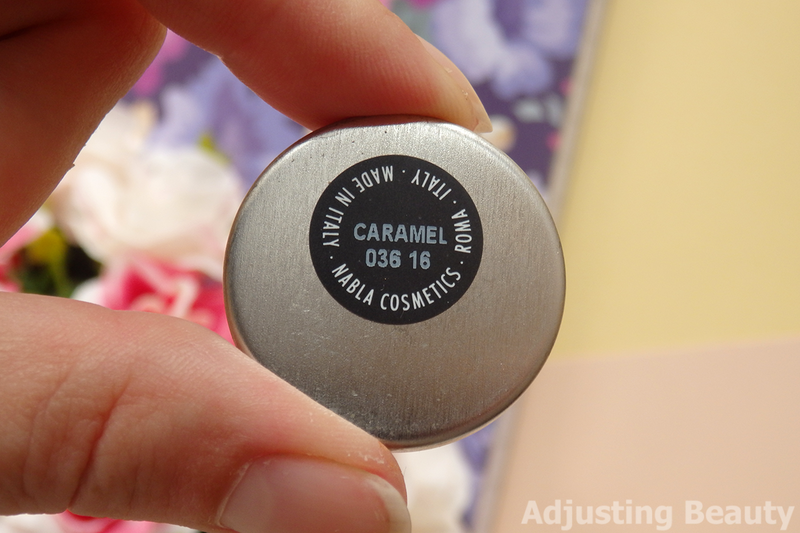 On the bottom of each eyeshadow is a sticker with the name of the shade. They also sell individual eyeshadows in plastic packaging. The packaging is black with transparent lid. You open it by pushing a small button in. I believe you can also put refills in these, but I haven't tried it yet, because I didn't wanted to ruin eyeshadow. In each is also 2.5 grams of product and the price is 7.99€. You pay higher price for the sturdy packaging as it's not a refill. So far I own four of their shades. 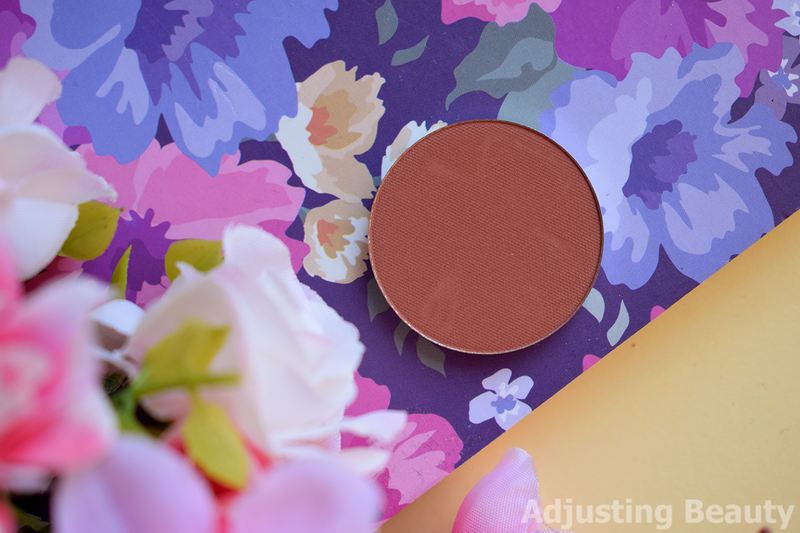 I've noticed that matte shades have better pigmentation and apply smoother. They don't have any fallout and with one swipe you get a good color payoff. While shimmery shades seem less pigmented or the formula is just not as smooth and you need to layer it in order to look bright on the skin. Shimmery shades also don't have any fallout. 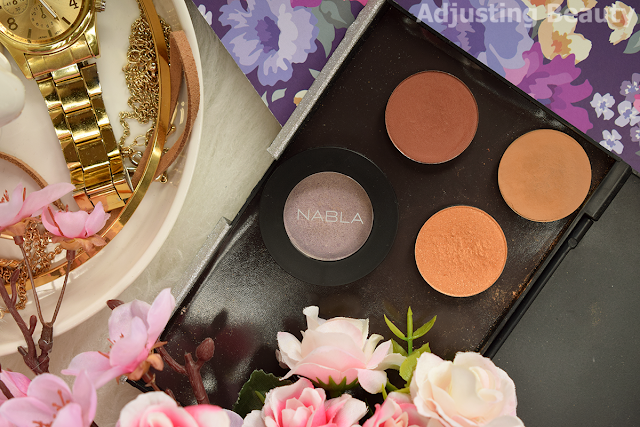 I always apply my eyeshadows over eyeshadow primers and that way these also last the whole day, although again I notice mattes being more long lasting and stay true to the intensity throughout the day. 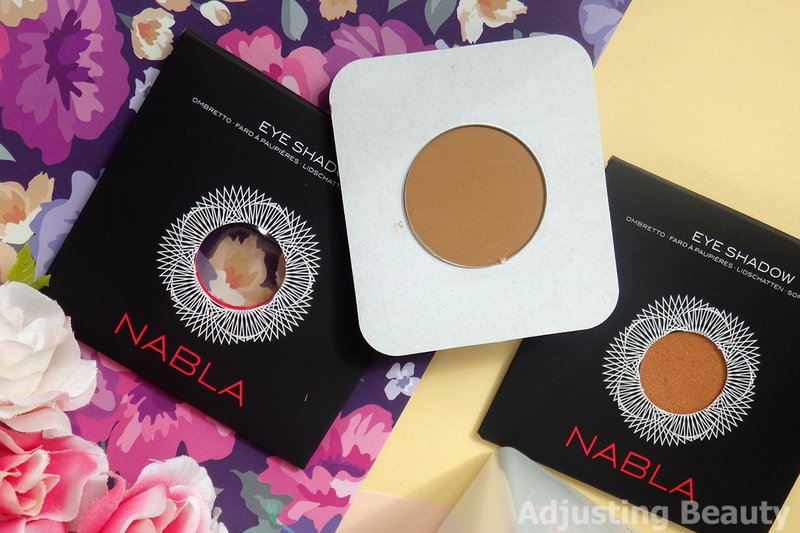 Matte eyeshadows have dry texture to them, they feel really smooth to the touch and the pigmentation is surprisingly good. It's still not as pigmented and as intense in one swipe as for example Zoeva, theBalm or Too Faced matte eyeshadows. These all have more of a buttery and wet texture and give more color payoff at once. 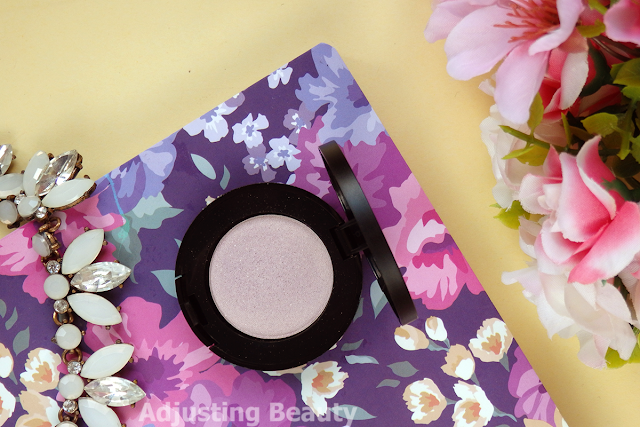 Shimmery eyeshadows have a slightly more wet texture, but it seems harder to the touch, so you need to layer it, because one swipe gives you a sheerer color. 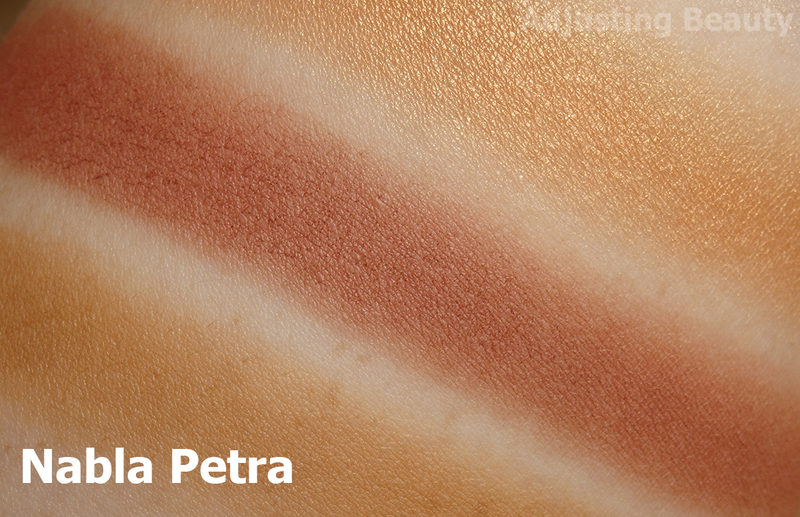 It's nothing compared to high pigmentation of Zoeva shimmery shades or theBalm. They seem more similar to Too Faced shimmery shades, as I find that these also give you a bit sheerer layer at first, but they're still more pigmented than those by Nabla. 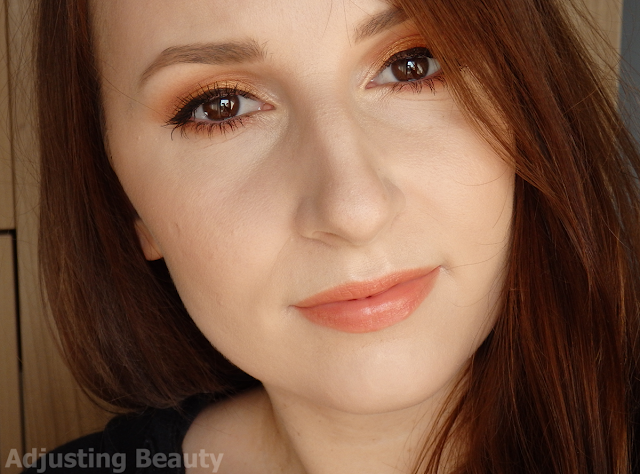 Caramel - matte light warm caramel brown. 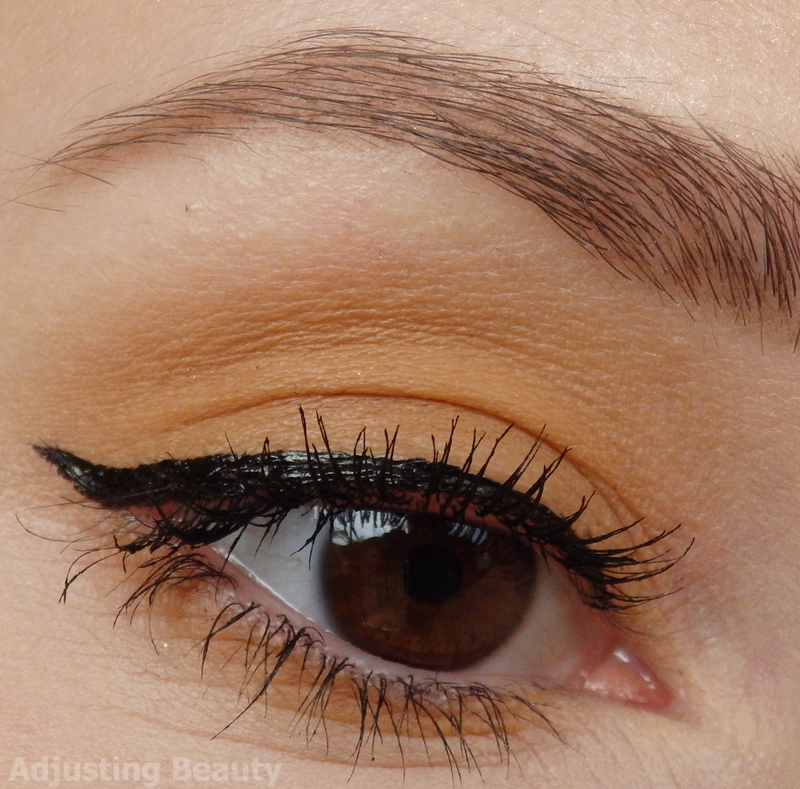 It has a lot of yellow and orange undertone, but could still be categorized under a brown. Petra - matte medium redish brown. Also one of those browns, but it has a very noticeable red undertone in it. Clementine - shimmery light yellow orange with golden shimmer. 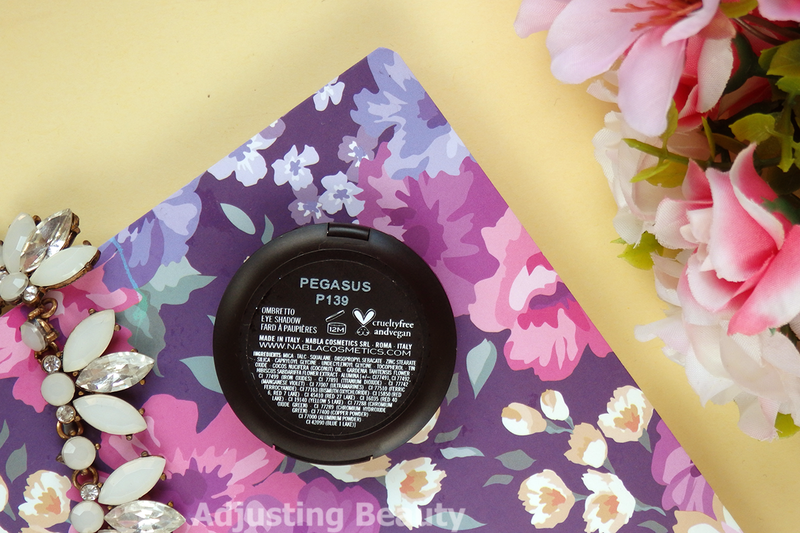 Pegasus - shimmery pastel lavender duochrome with golden champagne sheen. 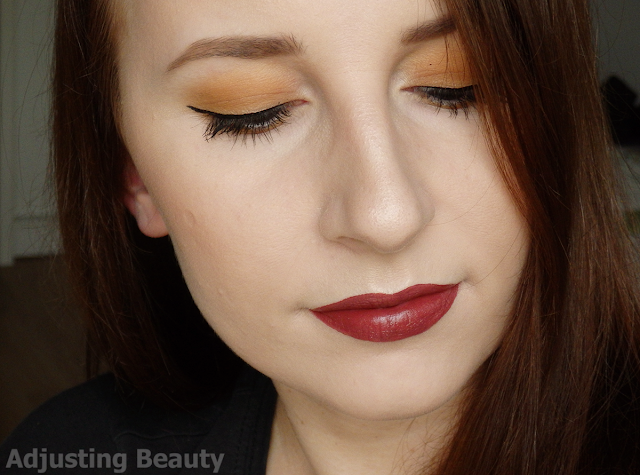 I compared some of my other shades, but found no dupes. These are more for you to compare, if you own any of the shades that I have. 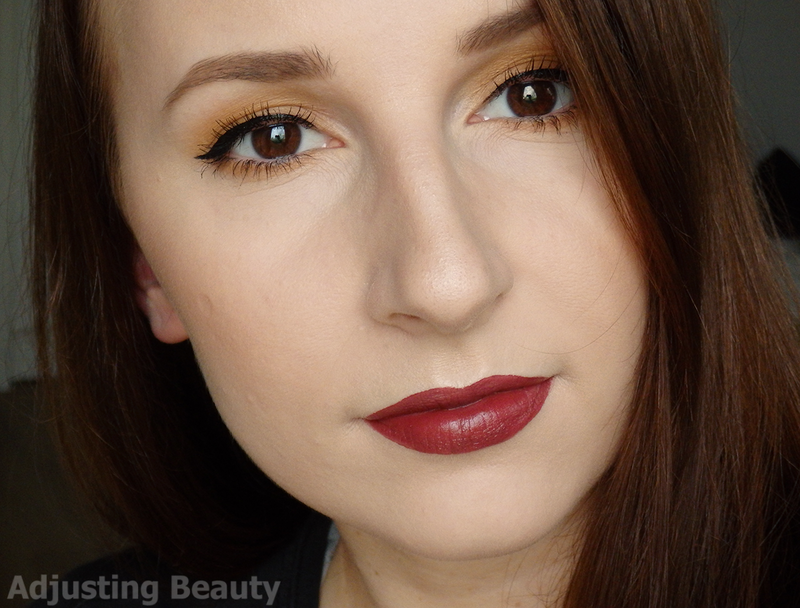 Zoeva Cocoa Blend in shade Substitute For Love is also a light warm brown, but it's more brown and less yellow toned than Caramel. Zoeva Cocoa Blend in Freshly Toasted is light brown with just slight red warmth to it, but it's more of a chocolate brown than Petra. 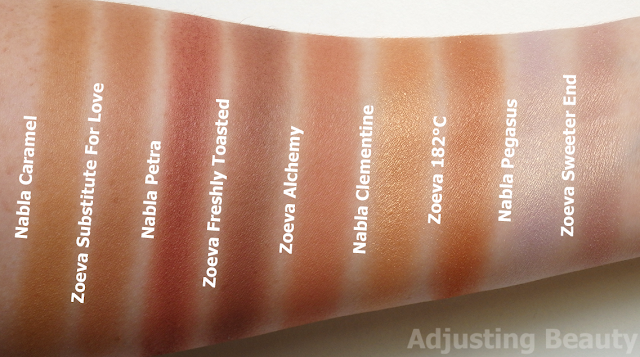 I also swatched Zoeva Caramel Melange in Alchemy, but it's more orange toned than red toned and also lighter. Zoeva Caramel Melange in 182°C is more orange than Clementine and has less sheen and shine. 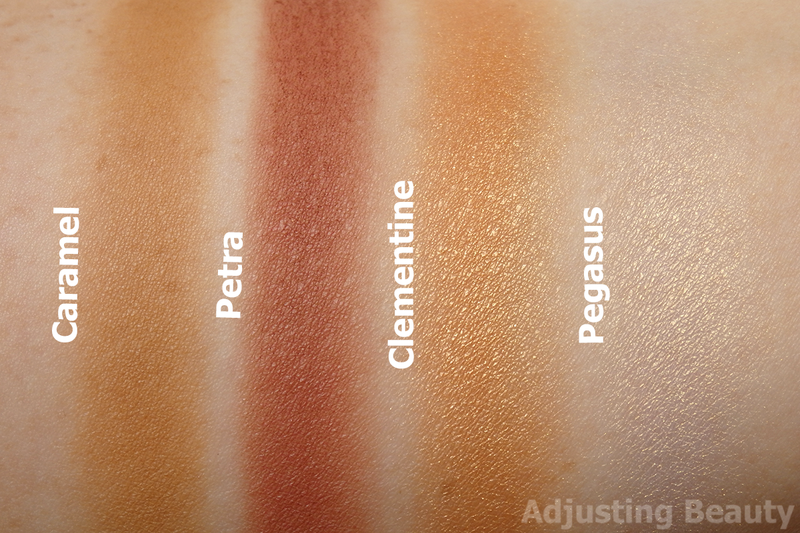 There's no color that would be similar to Pegasus, but I swatched it next to Zoeva Cocoa Blend in Sweeter End as it has that same golden sheen, but the base is darker and more pink mauve. In the next photos I applied each shade on my lid to give you an idea how it looks like on me. I have about NC15 skin tone and have naturally pretty yellow toned skin, so shades usually look warmer on me than they would on someone that has more neutral tone. 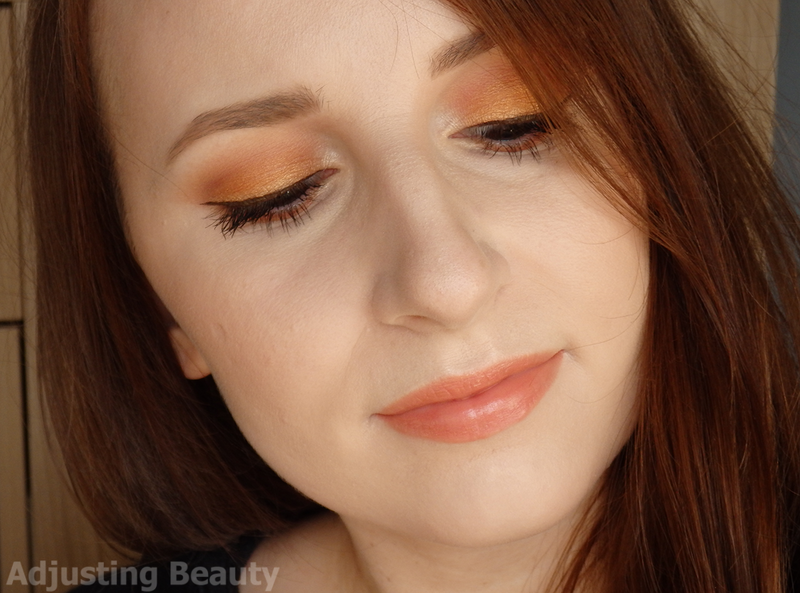 I applied Caramel all over the lid and it looks very warm and yellow toned on my skin tone. 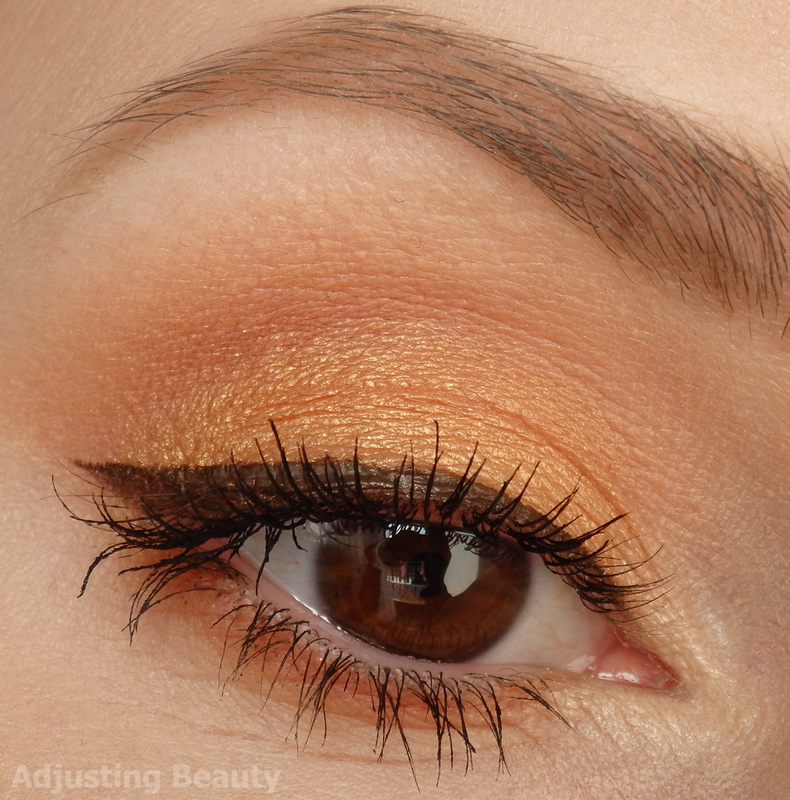 I absolutely love the warmth and lightness of this shade. 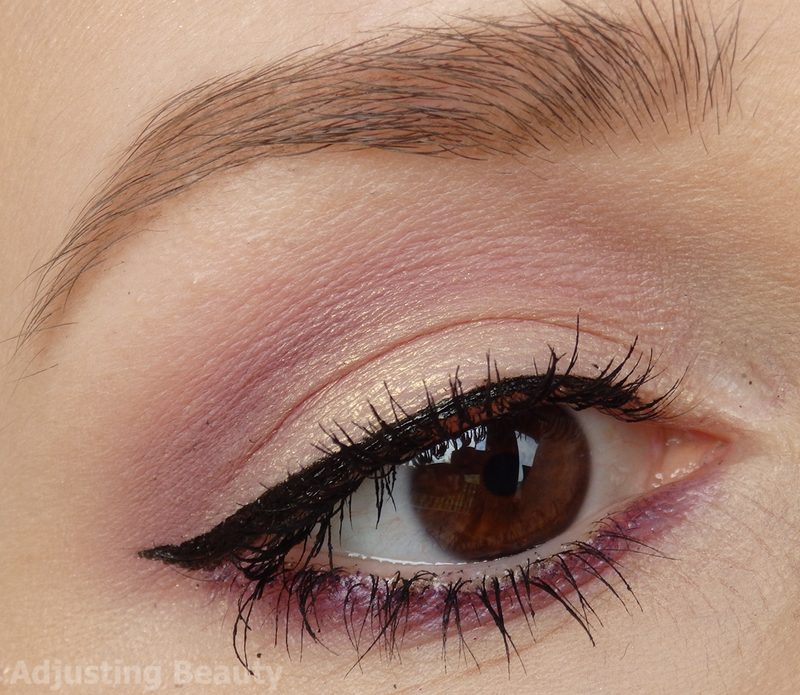 I would mostly use it in the crease to warm up other shades or just on its own. I also applied Petra all over the lid on its own. 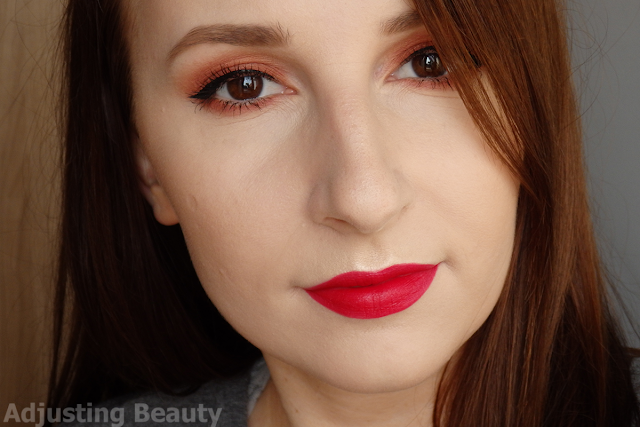 On me it blends out a lot warmer and a lot more red toned than it looks swatched. 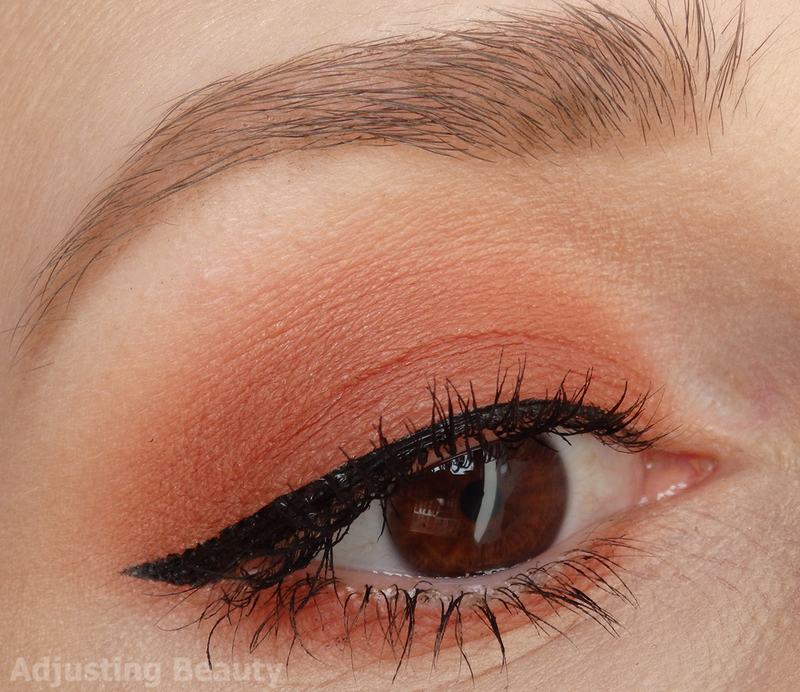 It's one of my favorite red toned browns so far. I love the warmth and rich color that it has. It's perfect as a base or in the crease. I have a special love for it because of its name Petra as this is my name also. I believe the shade quite suits my style, so I'm even happier for that reason. 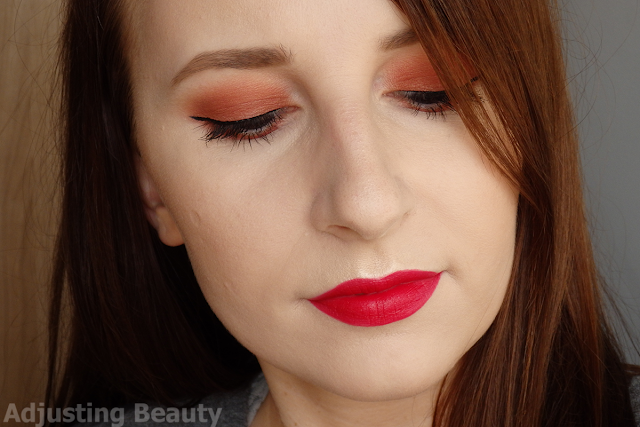 I applied Clementine on the lid and I also applied some warmer redish browns in the crease to make it a bit more wearable. 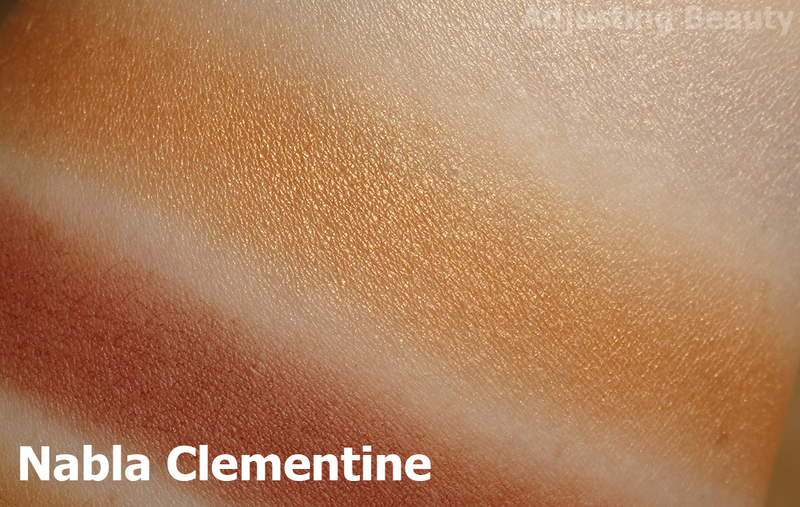 I find that Clementine can look really bright on my fair skin tone, but I adore the strong yellow undertone in it. The shimmer is not too obvious which makes it really wearable. This shade always makes me look brighter. 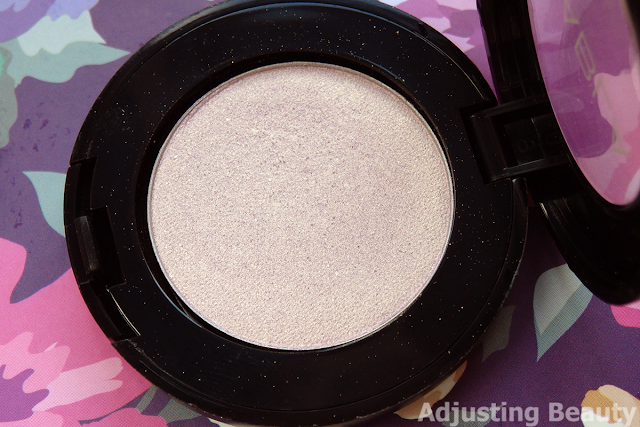 I had this on my wishlist, because it looked like such a fun twist with the lavender base and golden sheen on top. On me it doesn't come up as lavender, because the base is so pastel. It mostly just looks like a golden sheen. There's just a hint of purple peeking through it that's why I like to pair it with purple shades. 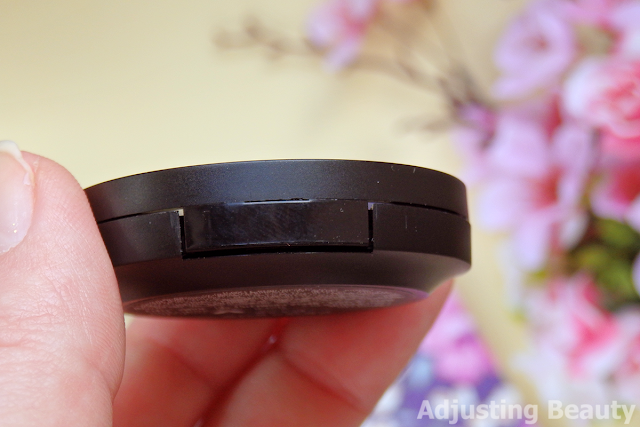 Here I applied it only on the center lid. 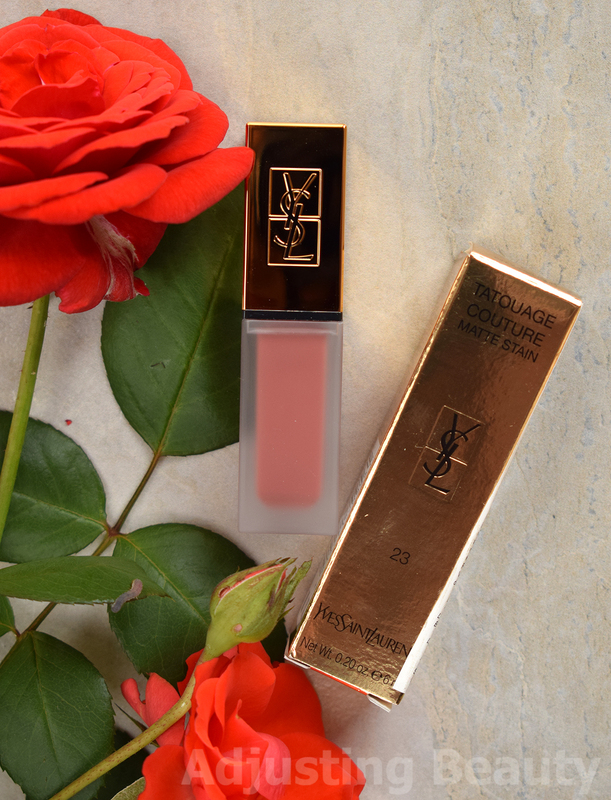 It's also good for applying over other shades, as it's so light and sheer that it gives you that golden sheen. 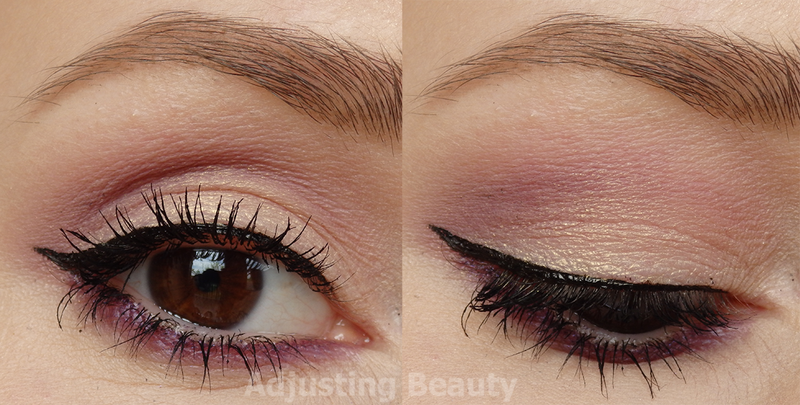 It also has duochrome feel to it, because it looks different from different angles. Sometimes golden sheen is more obvious and sometimes you see more of that pastel lavender. All in all these are some good shades. I still think that Zoeva, Too Faced and theBalm make more pigmented shades and the formulas are more buttery and wet, which I prefer, but Nabla sure can make great shades as well. 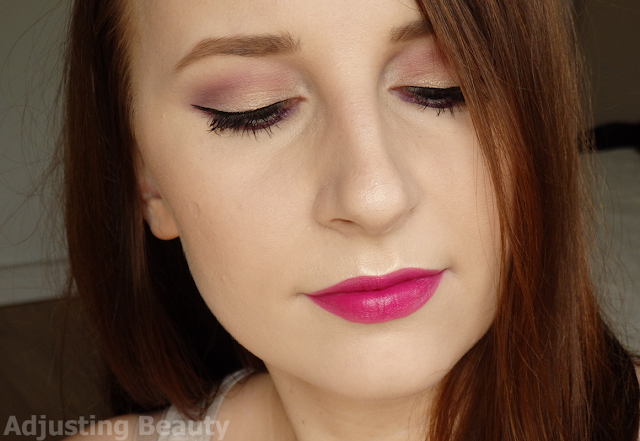 I would definitely recommend you smooth and pigmented matte shades. The shimmery ones are just a bit too sheer for my liking and too hard to the touch. 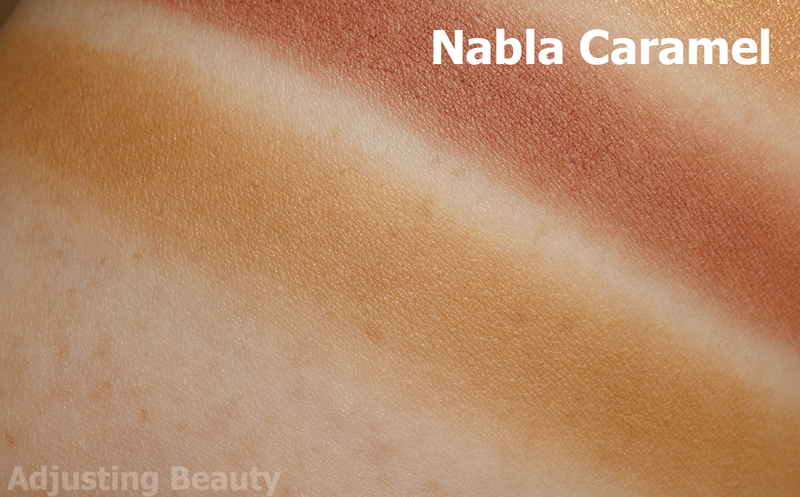 I like that Nabla offers a wide range of different shades that you can't always get in regular basic palettes. I still have some other shades on my wishlist that I would like to try out. Those are Peach Velvet, Madreperla, Selfish, Aphrodite and Water Dream. 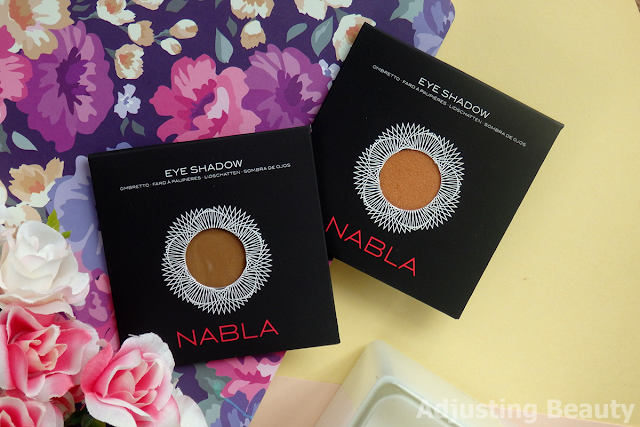 Nabla brand is also great option, if you're looking for a more vegan friendly and cruelty free brands. All their products are made in Italy. I haven't tried any of their other products, but I hear their bronzers and blushes are also really popular. Their Limited Editions also seem to offer interesting variety of shades. Have you tried any of their products and would you recommend them? 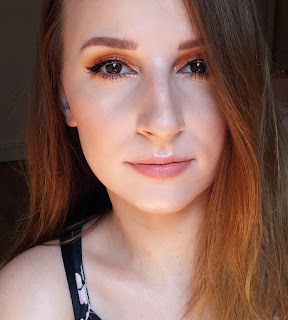 Sami lepi odtenki, sploh senčko 'Petra' si dobro izbrala, ti res super pristoji :) Makeup Geek tudi pridejo v podobnem pakiranju, kjer je senčilo zaščiteno samo s tankim kartonom. Nablo mam že dolgo nagledano! Za to znamko sem slišala same pohvale, zato me še bolj mika nakup le teh. Po drugi strani pa imam toliko senčk, da včasih ne vem katero bi uporabila. Odtenki izgledajo čudovito! The shimmery ones that you chose are few ones made that way, te collection that includes them is called Butterfly Valley and it is dedicated to the shades that can be stratificated, so you can choose the intensity. 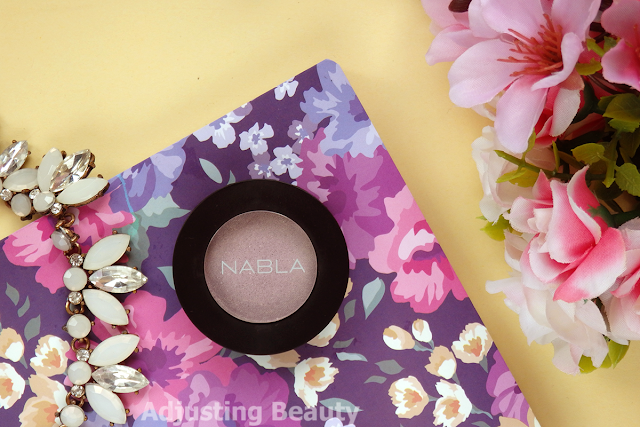 The majiority of the shimmery eyeshadows of Nabla are particulary buttery and pigmented! I recommend you in particulary Citron, it is unique, one of the "must have"s. Also Aphrodite, Juno Moon, Selfish, Luna, Calypso (if you like the color). Also Mimesis (soft matte), by the way it is fantastic with Citron. And Madreperla is one of my faforites, it is beautyful and like Pegasus yoy can use it not only as the single color (the color is realy tenue, it's the sheen that make a difference), but they are fantastic applied over oher shades donating a duochrome effect. Oh thank you for explaining and for all the recommendation. I already have Madreperla, Selfish and Aphrodite on my wishlist. Citron is totally my kind of color, I added it just now. The other shades are just as pretty, but I feel like I already own a few in my other palettes. I'm definitely gonna try out some more. These duochrome effects are especially pretty :).